If Sophie Jordan writes something, odds are I'm going to love it. 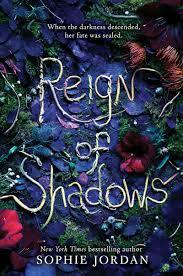 And (surprise) REIGN OF SHADOWS is no exception. I love dark fairy tale retellings and couple that with a favorite author? Bookish Heaven! RoS is one of those books you just know you're gonna love from the first chapter. Luna is a total rockstar and I loved reading about her, rooting for her, and cheering for her. She's overcome a lot in her short life, but she has this effervescent spirit that refuses to die. She's a total badass. Fowler is every bit as swoony as a girl could hope for. I loved watching as Luna broke through all of his defenses and he allowed himself to open up. It's kind of shocking how much is covered in this book (I mean, it's a little on the small side). Despite that, I found all the characters, plot, and world building (oh, the WORLD BUILDING) to be really solid. I can't wait for the next book. Seriously. Can I have it now? So ready to read this one. Everyone is raving about it in their reviews.